I just finished the WordPress MU for Joomla! latest posts module. This module pulls the latest posts site-wide. It has many configuration options so it’s pretty flexible. It is available to download from our downloads section. This entry was posted in Joomla and tagged new release, products, WordPress MU on May 28, 2009 by The Core Team. Can this module be used to display a feed from a stand alone WP site?My customer has both a Joomla site and a separate WP site and I am looking for a way to display the lets say 5 latest blog posts on the joomla site in a left module pos. There are so many ways you can accomplish this. 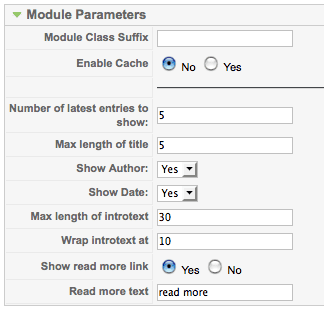 One is by modifying the module that I mention on this post. Another is by just pulling the posts through a module that pulls RSS feeds. Why not just integrate everything into one site? Its best for SEO. Is there anyway to limit the module to displaying latest posts from one blog only? Also, is there any plans to include image functionality? JoomlaArt’s Jabulletin module would be a great application to model this off ..
I’ll add this to our requests list.